Dress the clothes of one of the 4 officers of the emperor and try to increase your reputation to his eyes. 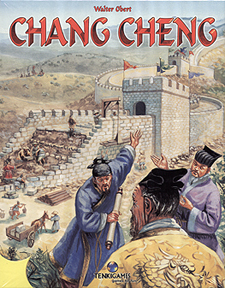 Build parts of the Great Wall trying to defend the Chinese provinces and competing with the other players to gain the reputation that comes from protecting the most important ones. But beware of the threat of the Mongols that hangs near the border. All players have the same opportunities and the final victory depends exclusively on you! I wish that there were more games like this! Short/opener/filler type games without cards are in very short supply. I'd love to see more like it - Clans, Tsuro, Patrician, King Of Siam, are all pretty good! This one is up there with the best. Here's what it's got going for it: it's very quick playing (forget the hour quoted, this is more like 30-40 mins for four players) It's got a fair bit of depth for a quick game There's about the right amount of varaition in luck terms - gives it extra replayability. It's VERY attractive - yes that is a plus in getting it to the table! It's simple to learn and play You have various methods of making progress - you won't play all of your peices and cards, so what you do with them is up to you. The action cards are elegantly done and add a huge amount of suspense for such a short game. The event cards add replayability and fun. The only weakness is that perhaps the game is still a little bit abstract - even with the superb pieces and elegance. Personally, I'll forgive it that, as there's so many good things about it.